Federal prosecutors today pressed the 9th U.S. 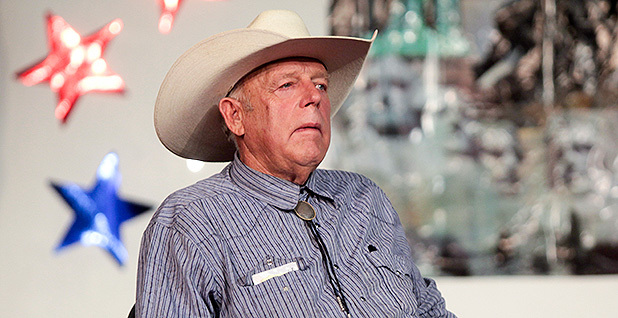 Circuit Court of Appeals to ignore Nevada rancher Cliven Bundy's latest argument against a new trial: an anonymous friend-of-the-court brief asserting his continued prosecution would be unconstitutional. The Justice Department filed an appeal last month that would allow a new trial of Bundy and three co-defendants on charges stemming from a 2014 armed standoff with federal agents near Bunkerville, Nev.
Nevada Chief Judge Gloria Navarro declared a mistrial in the criminal case in December 2017 — after finding that prosecutors had withheld key evidence from the defendants — and later dismissed the case with prejudice, which barred federal prosecutors from staging a retrial. Defense attorney Larry Klayman, who is representing Bundy in the appeal as well as in other court cases, has described DOJ's continued pursuit of his client as an "outrage," and has asked the court to void the appeal altogether arguing that federal prosecutors missed filing deadlines (Greenwire, Feb. 7). But new court documents filed by Klayman argued a new trial of Bundy would be unconstitutional. An anonymous friend of the court brief submitted by Klayman — and signed with the term "Amicus Curiae," rather than an individual or organization — asserts that a new trial would subject Bundy, his sons Ryan and Ammon Bundy, and Montana resident Ryan Payne to "double jeopardy" if approved. "The Department of Justice was intended to be an office of integrity," the 16-page document states. "This and any further frivolous filings from UNITED STATES OF AMERICA [sic] should be sanctioned harshly and without delay." Federal prosecutors asked the appellate court to reject the anonymous document, noting that the court requires identification on amicus briefs.